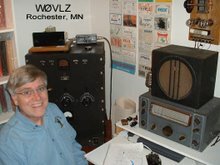 The Novice Rig Roundup is an nine day operating event "where radio amateurs contact stations using vintage ham radio equipment from the early era of the Novice license." I ended up putting 6 transmitters and 7 receivers on the air, everything from a 6AG7/Regen combo to a Drake B Line. It was great to get these guys on the air. Now that they are out of mothballs I'm looking forward to putting them all on the air on a more regular basis. Next year? That 75A4 and CE 20A should make a nice CW station.